You will be interested in these if you want to scale up your manufacturing. At high temperatures glazes are easier to fit to bodies and little or no frit is needed in recipes (meaning lower costs). High fire stoneware bodies are often less expensive. Ware is stronger (if vitreous and glazes fit) and harder and warping during fired is less frequent. Firings can be ramped up and down surprisingly quickly (as little as 3-4 hours). With an automatic controller a big gas kiln can be very consistent. Large kilns are easier and quicker to load and they adapt to firing lower and flatter ware much better than electric. And there are no elements to wear out. 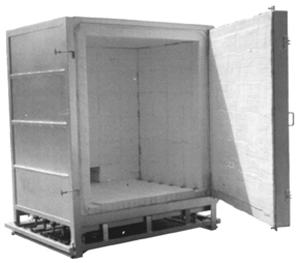 These kilns can be a big investment but can pay for themselves quickly and give you far greater production capacity. These are the only two gas kiln brands that have the necessary certifications to be legally imported and installed in Canada. Although you can buy direct and attempt importing one yourself, be warned. Canadian municipalities are highly regulated and getting permits and installing a gas kiln can take years. Border import issues can be very complicated (and expensive). Post-install changes, fixups and add-ons to satisfy inspectors can take many months and add a lot of money to the cost. We have done this many times. 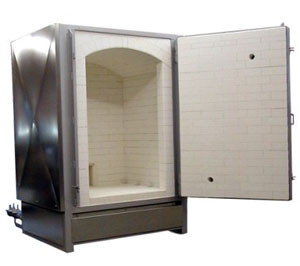 High-tech (and very high-priced) kilns can be imported from Europe, but do not assume they are better than a Bailey. Just because a kiln has fancy electronics does not mean it fires better, the basics of firebox and burner system design are still the key to a really good kiln. Customer satisfaction with this brand is very high and we recommend it. This is the brand to get if you want to manually fire the kiln, tweek the burners, take advantage of the firing expertise of friends or experts you have access to.